Stuck In The Buckosphere: Toys or technology? I often ask myself when I get a new gadget or piece of technology... is it really technology or a toy? Because I love playing with it. 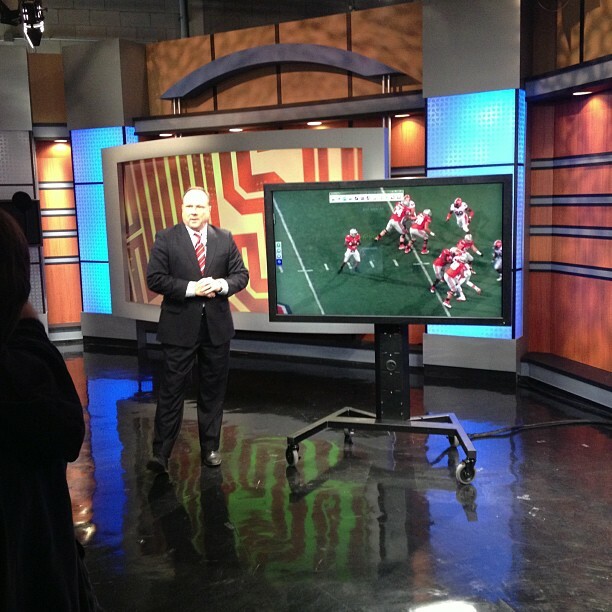 Tonight Clay Hall asked if I could help him use the new touch screen TV at the station. 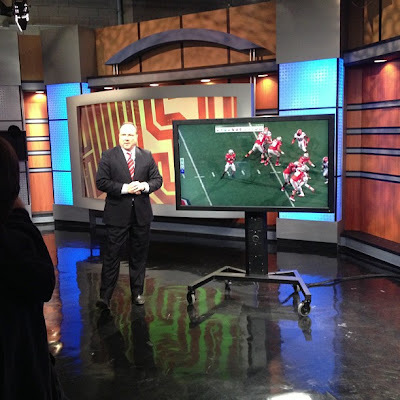 He wanted to breakdown a play from yesterday's Ohio State game. It took a little trial and error to get the correct file format that the computer/TV liked, but we got him up and running. I was lucky enough to use the TV for weather using my weather graphics routed into the unit, but I believe that tonight will be its first self-contained video graphic. That thing is SO awesome and I can't wait for election night because I will be helping use it to push our election coverage through the roof. Speaking of toys... 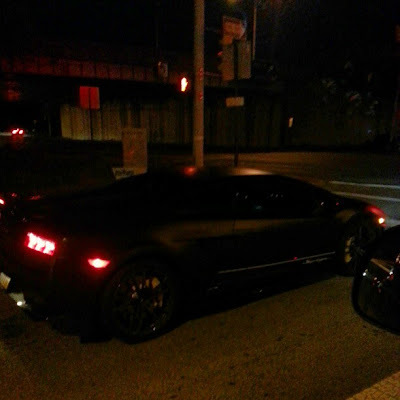 I had a Lamborghini pull up next to me last night on 315, heading home from work. He wanted to race, but we both knew that my 2002 Chevy Silverado would have left him in the dust. 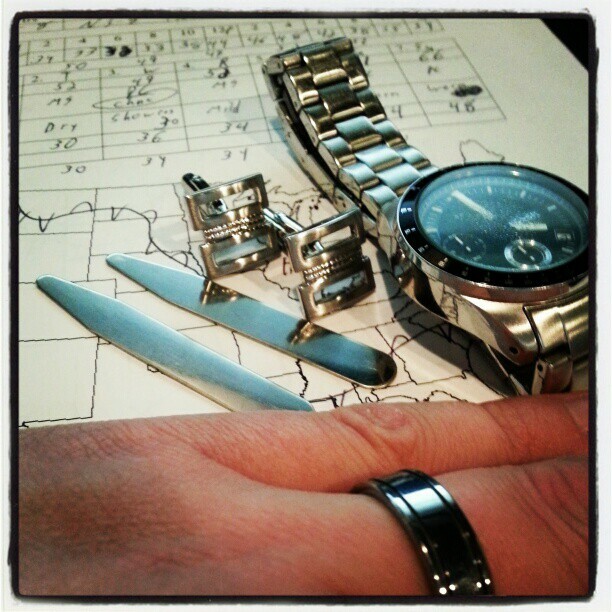 I spent part of the morning trying to find my favorite cuff links. Nothing special about them. I wore them in our wedding and it was bothering me that I have had to wear my back-up pair last night. It turns out that they were in my reporting desk in the newsroom. And here I was, searching the house like a mad man. I am a big fan of stainless steel...including my collar stays. I think I got three pairs for $5 online...GREAT buy. I always hated the plastic ones that bend. One of the assignment editors at my last station, Scott Bartles, told me that if I got the stainless steel or copper ones that I would never lose them... and he was right. I have wore the same collar stays for the last year straight. They don't bend and help weigh down my collar just the perfect amount. Anyway... fun little productive day! After a mostly cloudy Sunday, we will clear out heading into the workweek. More sunshine for Monday with cool temperatures then we slowly start a warming trend. Layers will still be needed with a chilly start each day. A dry start to the workweek, including Election Day on Tuesday, followed by a slight chance for a spotty shower on Wednesday. By the time we reach next weekend, we look to have highs back in the 60`s.